Indoor water parks in Texas are a great getaway not only from the pressures and aggravations of daily life, but also from the wild climate of the southwestern state. Visitors to the Lone Star state expect southern hospitality, cowboys, and heat, but the water parks offer a chance for locals and visitors a great way to cool down or warm up no matter the time of year. Indoor water parks, in particular, may prove safer for visitors than outdoor attractions during the turbulent thunderstorm season from April to September. There are multiple water parks for families to frolic in during the sizzling summers, but only four indoor water parks to visit year round. Despite experiencing warmer winters, the unpredictable Texas winter can include ice storms, blizzards, and sheeting rain. But even balmy days in the fifties and sixties are too cool to spend in water that isn't heated. Residents and tourists alike will enjoy the option of visiting the state's indoor water park locations in and around the Dallas area and further south near Galveston and Padre Island. Rated the best indoor water park in Texas by USA Today, the Schlitterbahn Galveston Island Waterpark opened in 2006, and its Wasserfest - ironically translated as "waterproof" - section can be converted to an indoor water park. During cooler months, as well as when the weather is bad, this section is enclosed and operated on weekends and holidays while the remaining sections of the park wait for warmer temperatures. The Wasserfest section makes up approximately one-third of the 15 acre park and includes many fun attractions. Guests who want a chance to dry off can also enjoy the arcade section of the park as well as snack booths and other classic park features. While the Wasserfest section of the park may not deliver the full thrills of the entire park, as the first of the indoor water parks in the state it has drawn attention to the popularity of these year-round destinations and has made Schlitterbahn Galveston Island one of the most popular water parks in Texas. 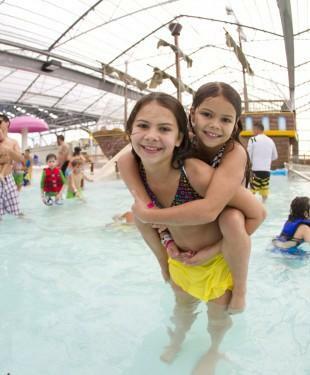 Schlitterbahn Galveston earned a number two rating in the top indoor water parks to visit by the Huffington Post. Located on the Gulf of Mexico, the South Padre Island Schlitterbahn has seasonal options for guests with a fully heated, indoor water park and outdoor park attached. However, this popular spring break destination for college students and families alike did not earn high ratings from visitors who reported bad service and high costs on TripAdvisor. Visitors do not have to stay at the resort, but special packages are available for vacation planning. To avoid peak crowds, do not visit the park on weekends or during school vacations. In summer time, the roof retracts to allow open air and sunshine. In the winter, it is strictly temperature controlled. The facility is also available to be booked for private events. Prior to planning a trip, visitors are advised to call ahead to verify the park is open to the public. Visitors described The WaterPark at The Villages as an unexpected gem and a great family treat on TripAdvisor. Located northwest of the Dallas-Fort Worth airport, the Grapevine, TX Great Wolf Lodge is part of a nationally established chain of indoor water parks that offer year round accommodations and splashy thrill rides. In addition to indoor water park attractions, guests can enjoy other features at this resort property, such as the black light arcade with more than 100 video games, the kids' craft and activity room, themed restaurants, the state-of-the-art fitness center, and the luxury spa. With more than 600 ratings, Great Wolf Lodge in Grapevine was rated a great vacation for families of all ages on TripAdvisor. 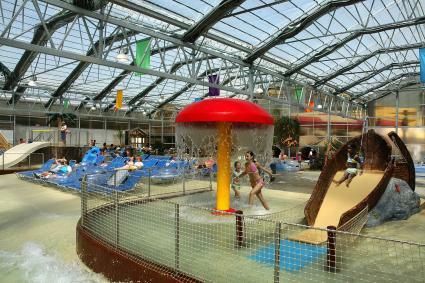 Visitors to indoor water parks benefit from the controlled environment, availability to visit in off season months, and avoiding sun burns and insects. Didn't find a park near where you are visiting? Don't worry, indoor water parks continue to be a growing trend in the state and around the nation.